See more objects with the tag personal, streamlined, rounded, communication, offices, simple, rectangular, writing, compact, portable, typing, boxy. See more objects with the color silver dimgrey grey darkslategrey or see all the colors for this object. 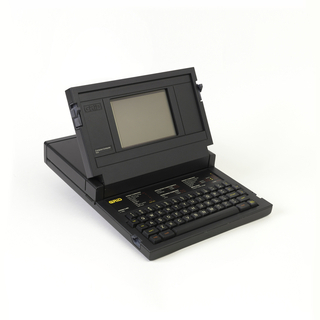 This is a Portable typewriter and case. It was manufactured by Paillard, S.A.. It is dated 1934 and we acquired it in 2006. Its medium is metal, plastic. It is a part of the Product Design and Decorative Arts department. The Rocket, developed by Paillard S.A. and engineered by Giuseppe Prezioso, is a typewriter identified with Hermes, the Greek god of travel and commerce. 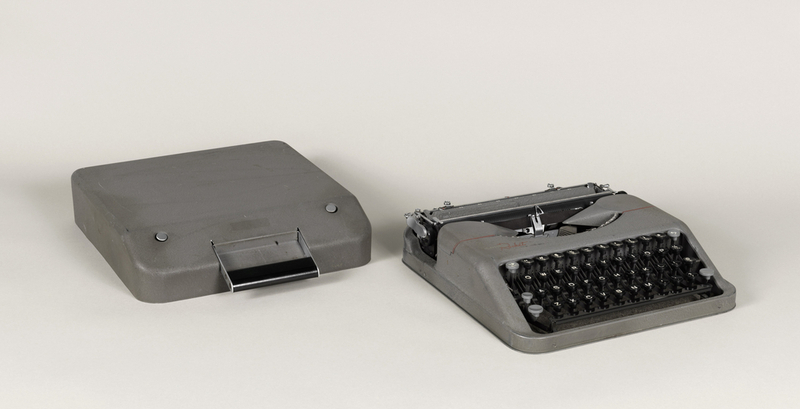 The model was part of the company’s portable line of Hermes typewriters (including the Hermes Baby and the Featherweight), which were the first truly small portable machines on the market. Revolutionary for its small and light form, the Rocket was conceived as a practical compact machine for travel, able to fit in a briefcase. The overall size and weight were reduced by economical construction: the case itself strengthened the frame and the internal parts were regularized. Size could also be kept to a minimum by means of the machine’s innovative method of printing capital letters by raising the carriage and roller instead of the typebars, so the typebars did not require extra space in the housing. Despite this change in mechanism, the keyboard and operation were the same as those of a standard machine. Inexpensive, portable, and reliable, the Rocket was a favorite of journalists and writers such as Ernest Hemingway and John Steinbeck. This object was donated by Edgar Sachs. It is credited Gift of Edgar Sachs. 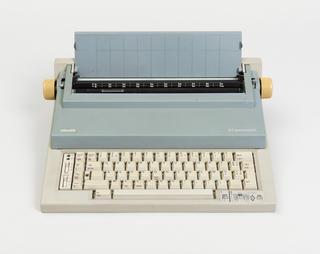 On typewriter, printed in white and red, top left: "Hermes Rocket"; printed in white, on back of body: "HERMES/MADE IN SWITZERLAND BY paillard s.a. YEVERDON/DISTRIBUTED IN U.S.A. BY PAILLARD PRODUCTS INC. 265 MADISON AVE., NEW YORK 16, N.Y."